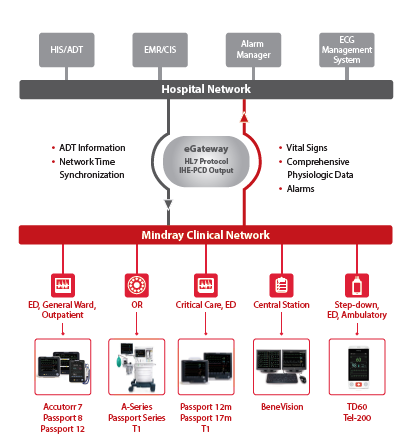 The Mindray eGateway Integration Solution is a powerful informatics component for bi-directional communications between networked Mindray clinical solutions and hospital ADT, CIS, and EMR systems. Supporting up to 1200 medical devices, the eGateway platform channels patient demographics from an HL7 ADT feed to individual monitors and systems, and also communicates results and patient data in HL7 to as many as four separate hospital information systems. The optional Alarm interface allows real time alarm output in HL7 ACM format to Alarm Management systems addressing the Joint Commission National Patient Safety Goals. For flexibility, the eGateway is available as a hardware solution or as a software only solution capable of VMware deployment. Network communication is achieved through utilization of standard HL7 protocols and use of the IHE-PCD profile. Experienced Mindray professionals are available, as needed, to provide mapping services for complete system integration.